The team met at the typical location – the Chevron station in North Plains around 9:00. We were on the road by 9:30. Arriving at the pull out to air down, we quickly let the air out and got on our way. Getting to the start of Archer’s Fire Break is always long and boring, but the hill shortly after the trail begins is sure to get the grease moving in the gearbox. 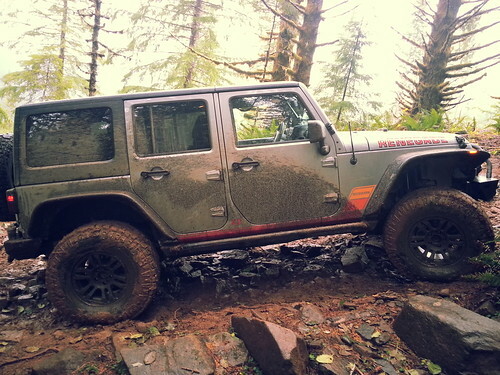 This first climb through dense green forest and loose, gravelly mud is just a preview of what is to come. Shortly after the first climb, the group found ourselves conquering an old foe – the “V Notch.” This long, steady climb also has a very angled stance with the passenger often looking at the ground as it passes by. The driver tries not to lose momentum even with their eyes closed. The extreme angle seems like your Jeep is going to tip over at any moment. The rest of the trail is actually a bit on the boring side. It is a series of small segments that continually intersect with the main forest road. Many of these segments are just long enough where you can get out of 4WL (or simply be in 6th gear at 4,000 RPMs) only to quickly have to re-engage. Many of these trail segments also are pretty featureless, save for a few deep water fordings in the wet months, or some short rock gardens. Jesse coming down one of the rock gardens along Archer’s Fire Break. The real coup de gras waits at the end of the trail like a predator stalking its bored and tired prey. The final stretch of this trail is called “Rocky Uphill” for, creatively, both the large number of rocks that litter the path and the fact is in quite uphill. There are two possible routes starting from the base of RH – the right and left – with the left side being rumored as the easier side. On this trip however, they both seemed equally scaled. The two options soon merge near the top, where the pitch of the hill steepens, the rocks increase in size, and the driver is again presented with two options: right or left. Right seemed to be the easier choice. The left side has seen vehicles roll over on previous days (granted it was a Toyota). 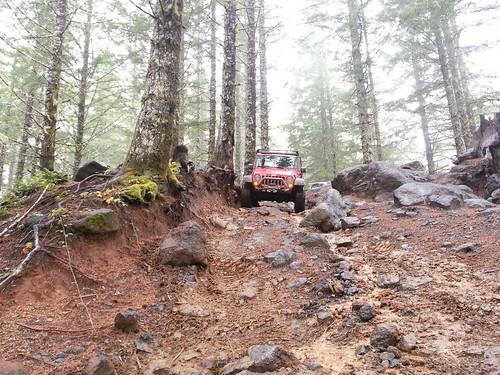 After Rocky Uphill, the trail continues with one last technical section, then meets up with the forest road for the drive back to air up and head home. Frank, after a long and dirty day.